In Loving Memory Of Jason. Home | Jason's heaven MySpace. | MUSIC BY DANIEL KOBIALKA. | AWARDS PAGE | A Special Page Done In Jason's Memory By A Special Lady Named Amanda | A Letter From Heaven. | My Favorite Photo's Of Jason. | Photo's Of Jason With Friends And Family. | My Poem Page In Memory Of My Son Jason. | A paper Jason did in high school I just wanted to share it. | My Snowglob Page. | Aminations. | Background And Banner Page. | My Roses Page. | Some Of My Favorite Sites. | Other Memorial Sites. | MY GUEST BOOK. | MY EMAIL ADDRESS. Hold me for awhile, In your arms. Keep me forever in your heart. I will come to you in your memories, and will visit in your dreams. Love me for I am, however brief that was. I am your Angel, a precious gift. Here is a rose for you Jason put into a bottle to hold it safe just as we hold you safe in our hearts Jason we love you and miss you always. Where to begin, Jason was such a wonderful kind loving young man if you ever met him you could not resist to love him he has such a special way about him. Jason made such a impacted on all our lives he will not long be forgotten. He just loved life and wanted everyone around him happy. 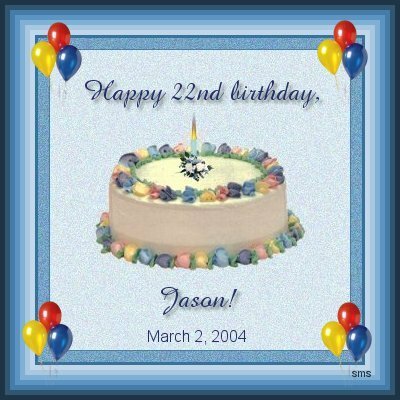 Nineteen years ago God blessed us with a angel his name was Jason. A special piece of spectacular that will forever remain in our hearts. Jason had a basketball shaped heart full of love and kindness. If you ever met him you would know how hard it was to resist him. Jason had such a way about him he was always there to help anyone in need. He would always have a hand to help you. I don't think Jason ever met a stranger. He befriended everyone he met. Jason had no trouble rejoicing the simple pleasures of life he loved living life he would grab life and run with it. Jason lived life the way Jason wanted to live it full of energy and kindess and love And being him self. Jason just loved making others happy if you were happy he was to. He loved the simple things in life such as fishing, hunting, swimming spending time with his friends and family and his brother and two sisters. He was such a joker he could have you rolling he loved to make us all laugh and he did it so well. He just loved seeing others happy and he like being the center of attention and he did it very well. But he was such a good natured person and when he entered a room you took notice. Jason was just such a sweet fun loving young man with so much to give us. I know that everyone he met he touched in some way or another you couldn't help but be touched by him. Jason loved living life to the fullest and that he did he loved challenges and conquering what he set out to do. Jason never judged anyone he took you as you were as he wanted you to take him. Just for who he was nothing make believe just honest and fun loving and being Jason. He just wanted you to love him. Jason had a ora about him when ever he was around you just never knew what to excpet. He always kept us on our toes and he liked it that way. Keeping us guessing and never knowing what he was fixing to do. Jason had many friends and friends that truely loved him and I know he touched them all in some way or another. I know that would please him to know he touched others in some way or another. But on Apirl 29, 2001 my son was taken from us the hardest day of our lives was to losse him. Jason still had so much more living to do, so much more life to live, He was taken from us all way to soon. 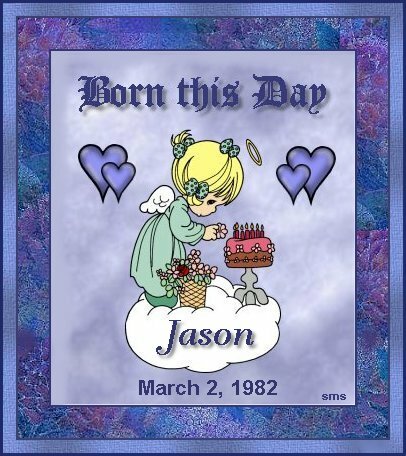 This day will not be forgotten the day Jason was taken from us a child that had so many friends and was so thought of. A child that could have accomlished every ounce of his desires. A child that fell prey to drugs and became a vitim of a incredible injustice that causes a unthinkable amount of suffuring. He had battled this off and on and had finally gotten his life together. And one night he made a wrong decision that took his life. A night that will not long be forgotten. But our childeren are not born to learn from everyone else's mistakes but rather to learn from there own. But all childeren grow up to become adults and they live there lives searching for there purpose on earth......Jason's life was short lived but it will not be forgotten. Jason found his purpose on earth. His purpose was to live for making everyone else's life happy and joyous. His purpose was to one day watch over his brother and his two sisters to be there special Gaurdian Angel. His purpose was to walk his path and live life the way Jason wanted to live it........Thank you Jason for fullfilling your purposes here on earth. And we thank God everyday for allowing us to have had the time we had to know you and love you. We will miss you always. 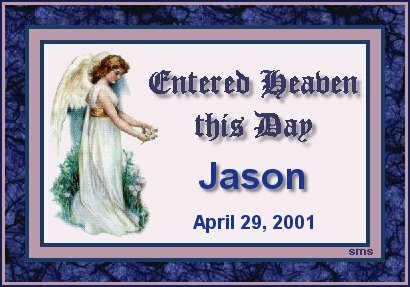 Jason is home now in heaven where all his dreams here on earth are spun into a fabric of unexplainable reality. A place where is is always hunting season and the fish are alwasy keepers. We all had so many wishes and dreams for Jason that will never be met. We all desire his presence and and his company we all long to say that one last thing to him. We all long to give him that one last hug, that one last I love you. But we know that Jason is up in heaven now where he is happy and at peace. And he watches down on us now and we keep him close in our hearts. Jason will never be forgotten and I know that he would want others to learn from what happend to him. But we have to remember what God said in psalm:30:5 "WEEPING MAY REMAIN FOR A NIGHT, BUT REJOICING WILL COME IN THE MORNING" We love you Jason and you will for ever be in our hearts until we meet you again on the other side. How much I miss you every day. How I miss you, nobody knows! And photos in a frame. Is in my heart to keep. You are with me still. But mine is worse than any. "I need you and I miss you so." So I'll tell you anyway. 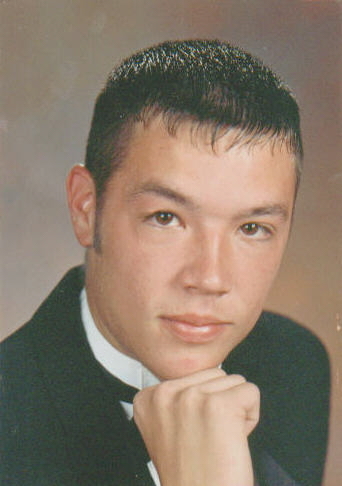 WE LOVE YOU AND MISS YOU JASON AND YOU WILL BEFORE EVER IN OUR HEARTS. REST IN PEACE NOW JASON UP IN HEAVEN WE LOVE YOU. A MEMORIAL DONE IN JASON'S MEMORY. WHEN I MUST LEAVE YOU FOR A LITTLE WHILE. And I, in turn, will comfort you and hold you near. Things that were given to me by wonderful people they are all beautiful. Thanks to all that gave me these things in my son's memory. HERE IS A QUILT THAT WAS DONE IN MY SON'S MEMORY BY (PRECIOUS MEMORIES QUILTS)THEY DID A BEUTIFUL JOB IT IS JUST WONDERFUL. SO TO SEE THE ONE DONE FOR JASON JUST CLICK THIS AND IT WILL TAKE YOU THERE. MY THANKS TO THEM FOR MAKING IT FOR ME. Death is nothing at all.... I have only slipped away into the next room. I am I, and you are you. Whatever we were to each other, that we still are. Call me by my old familiar name, speak to me in the easy way which you always used. Laugh as we always laughed at the little jokes we enjoyed together. Pray, smile, think of me- let my name be ever the household word that it always was, let it be spoken without effect, without the trace of a shadow on it. Life means all that it ever meant. It is the same as it ever was, there is unbroken continuity. I am waiting for you, for an interval, somewhere very near, just around the corner. All is well.